In 1985, European unemployment was in double-digits, youth unemployment was high in many countries (25% in France, 33% in Italy), and long-term unemployment was increasing. At that time, a group of distinguished economists that included Olivier Blanchard advocated that policies to lower unemployment must be two-handed – they “must act on supply (on structure) at least as much as on demand; otherwise, gains will be temporary at best and may in fact worsen structural problems” (Blanchard et al. 1985). Thirty years later, European labour markets are again in the doldrums. Aggregate unemployment remains high (though lower than two years ago). Youth unemployment and long-term unemployment (as discussed in a recent Vox article by Bentolila and Jansen 2016) are alarmingly high in some countries. Is it time to revive the two-handed approach? And will it work in a world of economic and monetary union and greater global capital and labour integration? This column reviews the advice that academic work offers to today’s policymakers, drawing in part on relevant work from two conferences, the IMF-OCP-Brunel workshop on global labour markets, and the IMF conference in honor of Blanchard. The global unemployment rate has slowly returned to its level before the global financial crisis. Among advanced economies, unemployment rates have fallen much faster in the US than in Europe. 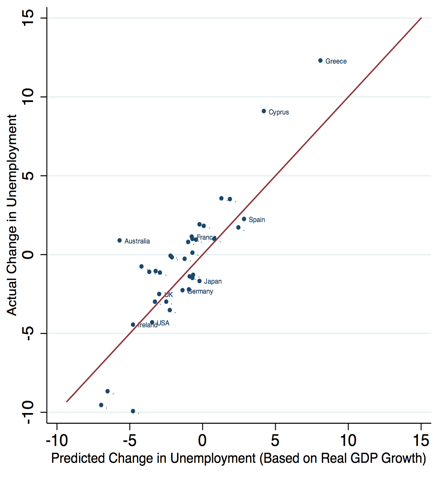 Figure 1 compares the actual change in unemployment in various advanced countries over the 2010-15 period with what could have been predicted on the basis of real GDP growth and the historical cyclical relationship between output and unemployment. It is evident that the change in unemployment across countries can largely be explained by the extent of the recovery in output. In this sense, Paul Krugman has been proven right in his assertion that unemployment was high “because growth is weak — period, full stop, end of story” (Krugman 2011). Source: An and Loungani (2016). In some countries, such as Greece, output gaps persist and unemployment is still far above its pre-crisis historical average. Domestic fiscal options are limited given concerns about debt levels and monetary policy is constrained by the common currency. A solution sometimes advocated for such countries is to lower unemployment through wage moderation, described as an ‘internal devaluation’ strategy. The efficacy of such a strategy is questioned by Decressin and Loungani (2015). They show that, if undertaken by several Eurozone countries at the same time, wage moderation can only work well if monetary policy is not constrained by the zero lower bound. In the absence of sufficient monetary accommodation, wage moderation does not deliver much of a boost to output in the countries that are undertaking it and also ends up lowering output in the Eurozone as a whole. A better way to help these countries would be through centralised fiscal support (such as investment schemes) and the use of fiscal space by Eurozone countries that still have it. Additional help comes from the ECB’s accommodative stance, which should be maintained and eased further if inflation remains below its anticipated adjustment path (IMF 2016). In contrast to the case of countries like Greece, there are several other countries –such as France – where current unemployment is now fairly close to its pre-crisis historical average. But that average is itself quite high. Reducing high average unemployment requires changes in many areas, particularly in product and labour markets, as argued over a decade ago by Blanchard and Giavazzi (2003). In product markets barriers to entry need to be eased in retail trade, professional services, and some segments of network industries. In labour markets, Blanchard et al. (2013) argue that excessive provision of either employment protection or unemployment benefits impairs the micro-flexibility of labour markets (the ability of markets to reallocate workers to productive jobs). This suggests an agenda of (i) easing hiring and dismissal regulations for regular workers, where they are judged excessive; and (ii) increasing the ability of the non-employed to find jobs by devoting greater resources to active labour market policies (and in some case also by reducing excessively high unemployment benefits). Have such reforms proved effective in the past? And will be they prove effective at the present juncture of persisting weak demand? Recent research provides reasons for cautious optimism. Will reforms hurt in slack times? Recent empirical evidence by Duval and Furceri (2016) offers guidance on the design of product and labour market reforms in a way that could avoid adverse effects on aggregate demand. Based on analysis of a new database of major policy changes for 26 advanced economies over the past four decades, they find that labour and product market reforms have generally raised output over the medium term but take time to pay off. The impact of product market reform, though not sensitive to conditions of demand, starts to be felt after only three years and fully materialises after about seven. The effects of labour market reforms do depend on business cycle conditions. Lowering employment protection and the generosity of unemployment benefits are expansionary when carried out during booms but can become contractionary in periods of slack. Can reform waves turn the tide? Another issue, highlighted by Fatás (2015), is whether to conduct reforms in many areas simultaneously or to focus on one or a few areas. Here again, recent empirical work offers some relevant evidence (Adhikari et al. 2016). A number of advanced economies have carried out extensive reforms of their labour and product markets since the 1990s. Adhikari et al. (2016) study six cases of well-known waves of reforms: in Australia, Denmark, Ireland, the Netherlands, and New Zealand in the early 1990s, and in Germany in the early 2000s. They use the synthetic control method, which measures the impact of reforms by assessing outcomes in the reforming country vis-à-vis a control group of similar countries that did not implement the reforms. Their results suggest that output was higher as a result of the reform in four of the six cases. The exceptions were Denmark and New Zealand, which in the latter case may have been because the reforms were implemented when macroeconomic conditions were particularly weak. The results for Germany suggest positive output effects from the so-called Hartz reforms, which created new types of temporary employment contracts, introduced additional wage subsidies, significantly cut unemployment benefits for the long-term unemployed, restructured the public employment agency, and strengthened activation policies more broadly. Krebs and Scheffel (2013) also find an increase in output following the Hartz reforms in Germany, though the magnitude of the effect is smaller in their calibrated model than in this empirical approach. To summarise, recent empirical work offers some room for optimism about the positive impacts of structural policies. But it is important not to over-sell these findings. The effects of reforms are modest and do not occure overnight (Duval and Furceri 2016), the ultimate impact on economic outcomes is complex and structural reforms are more reversible than commonly thought (Campos and Coricelli 2012). Labour mobility is an important adjustment mechanism to asymmetric shocks within a currency union and hence is particularly salient in EMU. As Turrini (2016) and Dao et al. (2014) show, labour mobility within Europe has increased in recent years, and during the global financial crisis, but not to the extent needed given the scale of the asymmetric shocks. The desire of those outside Europe to find a way in is likely to remain strong. The worsening unemployment picture in developing countries, and the projected increase in their labour force, suggests that the push factors in migration will remain strong over the coming years. David (2016) provides a rich description of the pressures to migrate from Tunisia in recent years. However, barriers are being threatened at the receiving end, despite ample evidence on the economic benefits of migration to recipient countries (Kahanec 2016). Research documents that immigrants alleviate skill shortages, enhance productivity through creation of new firms and industries, and lower prices for domestic consumers. There is lack of awareness of such benefits and also perception gaps about the extent of migration and the motivation of migrants. In France, for instance, opinion polls suggest people think that immigrants make up almost 30% of the population whereas the actual number is 10%. Similar misperceptions about the extent of migration are prevalent in other countries (Zhang 2016). A common characterisation of migrants is that they are motivated by the desire to receive welfare payments. Kahanec (2016) presents some evidence, however, that causality actually goes the other way – in areas with greater migration, there tends to be a policy response that leads to increases in welfare benefits, perhaps as an attempt to compensate any domestic workers who might be affected by migration. While migration faces political barriers, it is still worth touting the benefits of schemes (e.g. temporary worker programmes) that could help on the economic front without encountering stiff political opposition. First, though the unemployment picture in Europe is gloomy, it would have been much worse without the cyclical measures undertaken, particularly the easing of monetary policy. In some countries, unemployment still remains well above historical averages and measures to support a cyclical recovery are still needed. Second, unemployment in many countries is back to the pre-crisis average, but this average is too high. Here, the second hand of structural policies is needed. Recent empirical work surveyed here offers both hope that these policies do work and guidance about how to implement them without hurting aggregate demand. Third, domestic labour market outcomes are being increasingly shaped by global integration. Migration offers clear economic benefits but faces political and social opposition. Capital, however, seems to be able to flow past political barriers and is shaping labour market outcomes in a way that is just starting to be analysed. Abbritti, M and S Weber (2016), “Reassessing the role of labor market institutions for the business cycle,” ECB: mimeo. Adhikari, B, M R A Duval, B Hu and M P Loungani (2016) “Can reform waves turn the tide? Some case studies using the synthetic control method”, International Monetary Fund Working Paper 16/171. An, Z and P Loungani (2016) “Battling unemployment: A clear win for the ‘cycs'” conbrowser, November. Bentolila, S and M Jansen (2016) “Long-term unemployment after the Great Recession: Causes and remedies”, VoxEU.org, 14 November. Bertola, G (2016) “European unemployment revisited: Shocks, institutions, integration”, University of Torino: mimeo. Blanchard, O, R Dornbusch, J Dreze, H Giersch, R Layard and M Monti (1985) Employment and growth in Europe: A two-handed approach, Report of the CEPS Macroeconomic Policy Group, Economic Papers No 36, June, II/344/85-EN. Blanchard, O and F Giavazzi (2003) “The macroeconomic effects of labor and product market deregulation, Quarterly Journal of Economics, 118: 879-909. Blanchard, O, F Jaumotte and P Loungani (2015) “Unemployment, labour-market flexibility and IMF advice: Moving beyond mantras”, VoxEU.org, 18 October. Bonfiglioli, A and G Gancia (2016) “Economic uncertainty and structural reforms”, CEPR, Discussion Paper 10937. Campos, N and F Coricelli (2012) “Financial liberalization reforms and its reversals: Political and economic determinants”, Economic Policy, 27(71): 483-513. Campos, N and J Nugent (2016) “Labour market reforms, growth and inequality”, VoxEU.org, 28 January. Dao, M, D Furceri and P Loungani (2014) “Moving closer? Changing patterns of labour mobility in Europe and the US”, VoxEU.org, 1 December. David, A (2016) “Migration and employment interactions in a crisis context: The case of Tunisia”, AFD: mimeo. Decressin, J and P Loungani (2015) “EZ internal devaluations: Evidence on negative demand spillovers”, VoxEU.org, 2 December. Duval, R and D Furceri (2016) “The effects of labor and product market reforms: The role of macroeconomic conditions and policies”, IMF: mimeo. Eggertsson, G, A Ferrero and A Raffo (2014) “Can structural reforms help Europe?”, Journal of Monetary Economics, 61: 2-22. Fatás, A (2015) “The agenda for structural reform in Europe”, INSEAD, mimeo. Furceri, D and P Loungani (2015) “Capital account liberalization and inequality”, International Monetary Fund Working Paper 15/243. Kahanec, M (2016) “Free movement of workers within the EU”, CEU: mimeo. Krebs, T and M Scheffel (2013) “German labour reforms: Unpopular success”, VoxEU.org, 20 September. Krugman, P (2011) “The fatalist temptation”, The New York Times, 9 July. IMF (2016) “Euro area policies”, Washington DC, IMF. Turrini, A (2016) “Labour mobility and labour market adjustment in the EU”, EC: mimeo. Zhang, T (2016) “Global labour markets,” IMF: mimeo. Another concern about timing that is often expressed is that with the worst of the global financial crisis behind us, one of the powerful triggers of structural reforms has been lost. But political crisis (Campos and Nugent 2016) and economic uncertainty (Bonfiglioli and Gancia 2015), the potential for which is still present in both cases, have been shown to be even more powerful drivers of reforms than economic crisis. Furceri and Loungani (2015) show that increased capital market integration lowers the labor share of income.